Great for cakes, biscuits, muffins, bread or any other fresh-from-the-bakery & homemade baked goods. Just pop a sheet of FreshPaper for Bread anywhere you normally store your baked goods to keep them fresher for longer! Remember to let air circulate for the product to work. 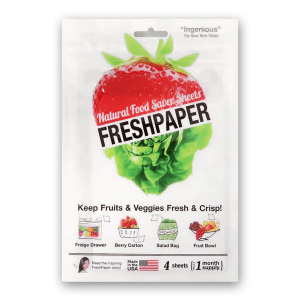 For the budget conscious, FreshPaper for Produce now comes in this affordable 4 pack. Just like the 8 Sheet pack, the savings in food wastage pays for itself in less than a month! 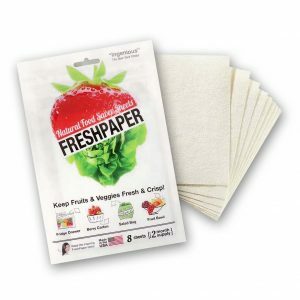 48 sheets for the price of 40 - SAVE $19.75 The average family wastes more than $1000 of fresh produce per year. One year's supply of FreshPaper will reduce your wastage by at least HALF! 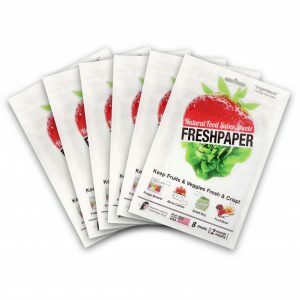 Buy 5pks FreshPaper for Produce and get one FREE Approx. ONE years supply! Urban Ethos Pty Ltd are the exclusive FreshPaper distributor for Australia and New Zealand. Our mission is to ‘Change Consumer Habits’ by being a market leader in providing a range of products that enhance the choices families can make to waste less, be more environmentally conscious and to lead healthier lives. © 2017 Urban Ethos Pty Ltd. All Rights Reserved.